Heritage Hills High School Implements Certification in CTE Engineering Program to teach industry skills which prepare students for the workforce. Autodesk software is used heavily in the industry, and I want my students to know it well so they can jump right into a job without the employer needing to train them. The Engineering Program, which is also a nationally certified Project Lead The Way® (PLTW) program, gives students access to state-of-the-art technology to learn computer-aided drafting and advanced manufacturing concepts. “Manufacturing and agriculture are the dominant industries in Southern Indiana, so I am striving to prepare my engineering students for the workforce or two- or four-year programs in this industry after high school,” said Jennifer Hohne, Engineering Instructor at Heritage Hills. 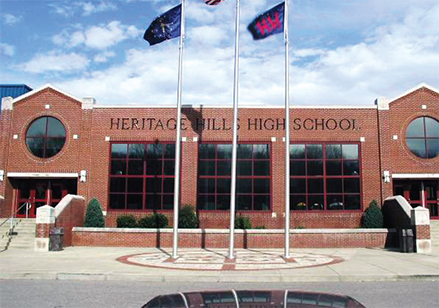 Approximately 75 students participate in the Engineering Program at Heritage Hills each year, taking courses such as Introduction to Engineering and Design, Principles of Engineering, Computer Integrated Manufacturing, CAD and Advanced Engineering. Hohne teaches all of the engineering courses, which include instruction in Autodesk applications, the industry leading 3D design and engineering software. After teaching the Engineering program for a few years, Hohne hoped to find a certification program to help her students validate their Autodesk software skills. She knew certification would boost their resumes and also satisfy the state’s requirements for an industry-recognized certification as one step to earning a technical honors diploma. Hohne researched certification and contacted Autodesk, but at the time they did not have a student certification exam available. They were, however, in the process of developing an online exam for students that would be distributed by Certiport. “I knew the Autodesk Certified User Exam being developed by Autodesk and Certiport was exactly what I needed, so I continued to teach the software in my courses and waited patiently for the exams to be released,” said Hohne. Hohne took an early version of the exam and provided feedback to Autodesk and Certiport. Then, she became a Certiport Authorized Testing Center and when they were ready, began to offer AutoCAD® Certified User and Autodesk Inventor® Certified User certifications to her students. Since Heritage Hills already taught Autodesk tools in the Engineering Program, they chose not to make any changes to the existing courses or curriculum for the certification exams. Students spent approximately an hour a day working with the software and then took the exam towards the end of the school year. The Heritage Hills AutoCAD course is a dual credit course through Ivy Tech, so students can also earn college credit with certification. Local industry employers see the value of certification, such as Jarid Hirt, Vice President at Spencer Industries. Spencer Industries is a custom thermoformer in Dale, Indiana. Hohne also teaches an AutoCAD course for college credit through Vincennes University with mostly adult participants, and she hopes to expand the program to allow more members of the workforce and community to certify. “The incumbent workers in our local economy would benefit greatly from this instruction and exam, I truly hope we can expand the program to help the economy in Indiana,” she said. Certiport is the leading provider of certification exam development, delivery and program management services which include practice tests via MeasureUp® delivered through an expansive network of over 12,100 Certiport Authorized Testing Centers worldwide. Certiport manages a sophisticated portfolio of leading certification programs including: the official Microsoft Office certification program, the Microsoft Technology Associate certification program, the Adobe® Certified Associate certification program, the CompTIA Strata™ IT Fundamentals, the Autodesk Certified User certification program, the Intuit QuickBooks Certified User certification program and the Internet and Computing Core Certification (IC³®). For more information, please visit www.certiport.com. “Certiport” and “IC³” are registered trademarks of Certiport, Inc. in the United States and other countries. The names of actual companies and products mentioned herein may be the trademarks of their respective owners.